How to visualize parts in parts? For example, I have a lot of pets and I want to show how many of each kind of pets are boys vs. girls . 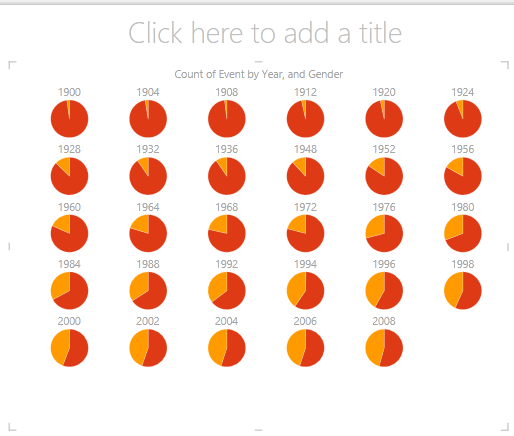 It will be possible to make the graph interactive, like clicking on a specific segment to see any further details. Although, I still want to give the user an overview of all pets and how many are boys/girls. It is not important to show the total number of each pet. Also, it is not necessary to show all in one graph, it could be several if you see any point in that. 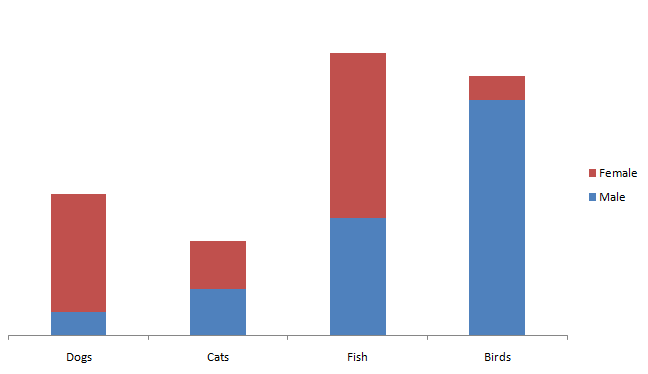 A double bar graph sounds like the best chart type given your specifications that the chart must display the male/female split of each pet, and that the total number of each pet does not matter. You could use ZingChart for interactive charts. Since the main functionality you wanted was interactivity here is a pretty standard chart. You also mentioned the ability to click and get more information. This is possible using drilldown charts, but your post doesn't have enough information to make a demo relevant to your initial specifications. If you provide me some additional details you would have when "drilling" down, I would be more than happy to make that for you. A suggestion could be to use what is a concept popularised by Edward Tufte known as 'small multiple' or a 'multiple chart' type. It is essentially tiling multiple charts of the same type so that you can get an overview of the distribution/patterns while still having a clear enough individual view to work how where you want to drill into for more details. But to make it more user friendly, you might want to use icons instead of labels to represent each type of pet. Not surprisingly (and just so I am not biased towards a particular vendor/solution) Tableau also has this feature built into its offering. Not the answer you're looking for? Browse other questions tagged info-visualisation charts graphs infographic or ask your own question. How to visualize a large Neural Net? How to visualize progress in categorized data? How to represent the graph in terms of parameter in specific requirement?